Are you pressed for time? Did you hear about an event late? Do you need a gift sent to a hotel or hospital, or out of town? 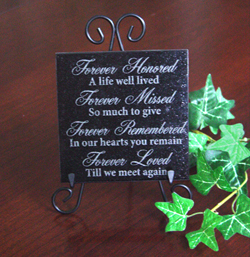 Contact us for baby gifts, expressions of condolence, get well, happy birthday and congratulations gifts. We can make many suggestions within your stated budget...many more than can be shown on our website. Human Resources departments, office managers, and administrative assistants of corporations send HollyBarry House gifts and gift baskets to both clients and employees to express "Get Well" wishes, congratulations on the birth of a new baby, or expressions of condolence when there is a personal loss. HollyBarry House gift wares & gift baskets are less perishable and far more memorable than flowers or fruit. 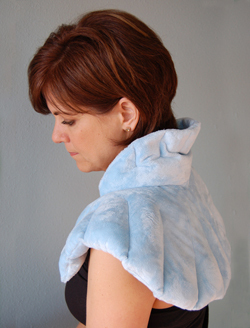 Can be warmed or chilled for needed comfort--perfect for relieving stress, tension, muscle pain, stiffness or cramping. Wrap stays in place while walking, standing or sitting. Use chilled to reduce inflamation, or warm in microwave to enjoy penetrating heat and aromatherapy benefits of the 100% natural herbs and grains. Also available in silk-like embroidered fabric at slightly higher cost. Touching words at a touching time are a lasting reminder of your caring. 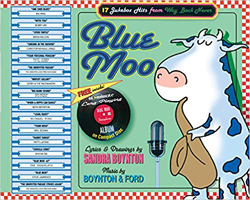 We stock many board books, bathtime waterproof books and book/CD sets. A gift an infant can grow with or an older sibling can enjoy. Capturing this most precious time of life, these figurines are the perfect gift for a baby shower, Mother's Day, or new baby gift. Several designs are available. 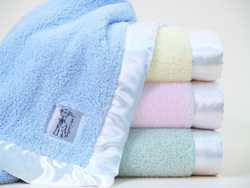 The "crème de la crème" of baby blankets, these lush products from Little Giraffe™ are as soft and cuddly as possible. Double thick chenille is edged in silky satin. Crib size or travel blanky size, it'll be baby’s favorite. "Just a short note to tell you how much (name) liked her basket. She was gushing when she told me it was big, beautiful and filled with wonderful things...She said 'You have no idea how receiving such a gift from my company made me feel so special and cared about.' She very much liked the lavender items, the blanket, and all the various items you included. I wanted to take the time to let you know--this was exceptional feedback--and passing it along to you so you know what a good job you do for us!" "This morning I received a get well gift from friends that originated from your company. I just wanted to take a minute to compliment you on your selection as well as outstanding presentation. It certainly made me day and helped to make me feel better."